F or the uninitiated, "Dracula," for many is a vampire who wears a black tuxedo and sometimes turns into a bat after he seduces women with his hypnotic stare. He speaks with a Romanian accent and says silly things like, "I want to drink your blood," He is a monster that preys on women, and in a venereal sense, is a creature of lust. However, "Dracula Untold" attempts to tell the story behind the legend and bring to light the historical figure that Bram Stoker hinted at in his 1897 Gothic Horror novel. Luke Evans ("The Hobbit: The Desolation of Smaug," "Immortals") plays the semi-historical Prince Vlad of Transylvania. Sarah Gadon ("The Amazing Spider-Man 2") plays his wife Mirena, and Art Parkinson, little Rickon Stark from the HBO series "Game of Thrones" is Ingeras his son. Although freshmen director Gary Shore and writers Matt Sazama and Burk Sharpless attempt to fill in the details behind the mystery of who Dracula is, they fall short in the history department while trying to make up for it in effort, special effects and action. This is the second origins blockbuster film for 2014. The first, "Hercules" staring Dwayne Johnson did a decent job bringing a version of the demigod to the big screen that is a more human and perhaps a more honest view at how we see ancient legends. Bram Stoker gave only a few hints in his novel of who he was basing his dark count on. For instance during one of Jonathon Harker's conversations with the Count, Dracula mentions that his family comes from the proud Székelys, and Boyars who fought Ottoman Turks in defense of his people and their lands. This narrows the field down to Prince Vlad III of Walachia, situated next to the region of Transylvania. Although Stoker displaces Vlad III to the Transylvanian Carpathian Mountains, there was no person other than the reviled Vlad Țepeș, the Impaler. Even more specific is the name Dracula, as Vlad III was a Christian Knight in the Order of the Dragon, or Dracul, or Dragkwlya. As the reputation as the bloodthirsty Prince spread, 400 years later, Irish playwright and theater manager, Bram Stoker, created a vampire story around that legend. Others say that Stoker had his story pretty much outlined when he was looking for a name for his vampire and came upon the bloody prince. "Dracula Untold" attempts to bring back Stoker's Count by providing the audience with a few morsels of truth about the infamous man behind the legend, as well as plenty of Hollywood myth making tossed in for good measure. In this version, a narrator recounts how Vlad and his brother Radu “The Handsome” were given as political hostages as a children and were educated by the Turks. He learned the Quran, Turkish, literature, logic, and the Art of War. Instead, Sharpless and Sazama turn the atrocious Vlad into a sympathetic anti-hero. Yes, Vlad the Impaler was a Christian Crusader who took up the cross during Pope Pius II's Crusade against the Ottomans, but he did so with such gusto that both friend and foe alike reviled him. "Untold" presents us with a man born into a cruel world and tries to soften the edges and humanize him. As the narrator tells us, after leaving the captivity of the Turks, and returning to his own lands to reign, he renounces violence, and like Rock’s character in “Hercules,” intends to settle down and become a stay at home prince to his wife and a good and loving father to his son. After encountering evidence that the Ottoman Turks are on his lands, he and a small band of his men track the Turks to a bat infested mountain cave. Within the cave, they find the bones of humans who have lain there for centuries, along with the recently dispatched Turkish scouts. So many so, that Vlad realizes that something darker abides there. In a decent scene of horror (for a PG-13 movie), Vlad finds a creature who is so strong, but also so monstrous that he files that information for later. Returning to his home, we find that he has a beautiful wife (Gadon) and a well-bred, and unspoiled son (Parkinson) waiting for him to return. Shore allows us to see for ourselves perhaps the reason why Vlad hates the Turks so much as he removes his shirt to reveal horrible scars on his back from the whippings he endured when he was their prisoner. While he and his family are in the midst of celebrating Easter in his grand hall with both servants and people of his court, Shore depicts Vlad as a noble and generous prince. The Turks march in and interrupt the feast demanding their tax and levies for their Janissary corps. Janissarys are male children between the ages of 8 and 15 that serve in an elite corps of the Turkish Army. This sets the stage for rest of the film. Vlad is a good person only trying to save his family and his people. He has almost no army, and as he begs Mehmed II to leave his son out this deal, his hate returns with the memories of abuse at Mehmed's father's hands. Dominic Cooper ("Need for Speed," "Abraham Lincoln: Vampire Hunter") plays the Sultan Mehmed II who serves not only as the villain, but also as the catalyst that forces Vlad's hand in deciding to turn to the dark side. Returning to the bat cave mentioned earlier, he encounters a very old and ancient evil that may supply him with an answer to his dark prayers. "Game of Thrones" Charles Dance plays the very old Master Vampire. A dark Yoda of sorts, he cautions the young prince on the pitfalls of immortality and the need to feed. Yes, he will become a hero, but many will hate him. Unlike Louis and Lestat in "An Interview with a Vampire," Prince Vlad is given time to decide if he has buyer's remorse. He has three days to defeat the Sultan, however, the need to feed on human blood will become unbearable, but he cannot drink blood in that time. If he does, his change will become permanent. What would you do? Would you accept the dark side in order to save your loved ones? Or, would you stay the course and give in to the Sultan and wait until you have built your army? What the film does mention that is more or less historically accurate is that Radu, Vlad's brother, sided with Mehmed during the upcoming battles. From here on out, the "Dracula Untold" becomes a formula action film with somewhat melodramatic bitter sweet doomed romance, and plenty of CGI shenanigans which include Vlad morphing into not just one bat, but into an entire colony of them. The blood and gore is kept to a 21-century minimum, and the horror and thrill are more at an action level rather than going for the paranormal suspense and fear. The battle scenes are shot close up in the "Jason Bourne" style of dizzy and frenetic camera work, more of a blur if you will. Luke Evans' acting is stiff at times but conveys the charm of a prince and the brooding weight of responsibility for others. Dominic Cooper's Mehmet isn't around enough to like or dislike the character nor is Cooper's acting is of anything to note. 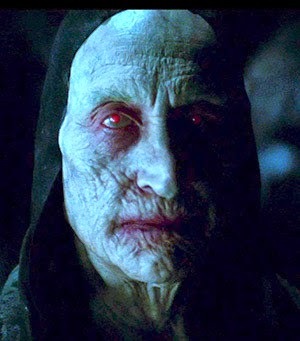 Charles Dance as the creepy and demonic Master Vampire is probably the only real scary part in the whole film. Vlad's son Igneras is just another kid whom the audience are supposed to feel concern over his fate. Unfortunately I didn't. If anything i felt the film was lacking in passion (except for Luke Evans) for the whole film seems to me to be on the same level as Johnathon Harker played by Keanu Reeves, in Francis Ford Coppola’s “Bram Stoker’s Dracula.” The special effects in “Untold,” in some ways overshadow the story, and not in a good way. Watch if you are looking for an average action film with just a tad bit of history, stay away if you are looking for that special film that you will remember as an important part of the Dracula cannon. If anything I give the director and writer some points for effort. 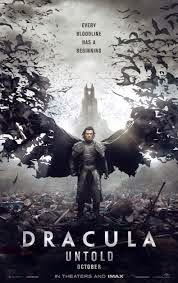 "Dracula Untold" opened in theaters on October 10, 2014 and on DVD and Blu-ray on February 3, 2015.